Soong Kee Beef Noodles @ Chinatown, KL - Always Travelicious ! Soong Kee Beef noodles has been around for a long long time. Imagine my friend of almost 60 years old says that he’s been eating at Soong Kee since he was in high school. That’s at least 40 years there ! The modest shoplot is swarmed with dedicated patrons. Fortunately the turnover time is pretty fast you’ll just have to be patient to get your table. Remember to check out for more tables upstairs. We called a small bowl of mixed offal with beef slices, beef balls, tripe and tendon (RM 7 for small; RM 12 for large). I am not a fan of offal soups because sometimes the soups can have a strong smell. There was nothing of that sort to worry about at Soong Kee. The beef slices were cooked to perfection, just enough to get rid of the rawness, evident from some of the slices still having a tint of pinkness to them when they arrived. That pinkness quickly went away as the slices remained in the hot broth. Melt-in-your-mouth kind of tender, the beef slices were utterly thin and supple; a proven recipe to entice you to the moon and back. The beef balls were light, airy with a crisp bite while the tripe and tendon were satisfactory. The noodles (RM 4 for small, RM 5 for large) had a copious portion of simple yet flavorsome minced pork; copious enough so that there was a bit of minced pork with every bite. The noodles though could do better as it had a faint alkaline taste and they were just not springy enough. Go to Ipoh and try the wantan noodles at Ipoh Stadium then you’ll know what I mean. 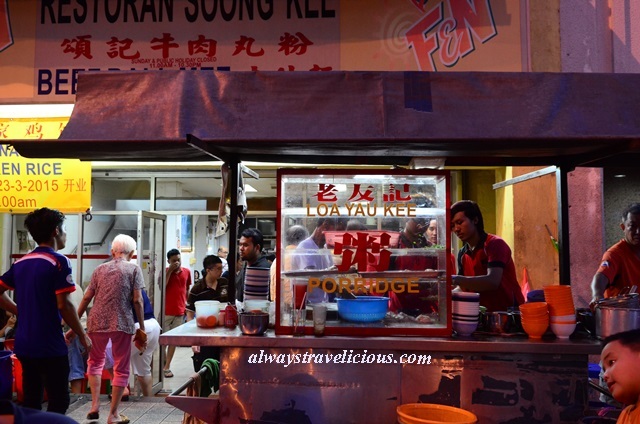 It’s Ok if you don’t fancy pork noodles because there is also the popular Loa Yau Kee Porrdige located in the same compound as Soong Kee. Address : 86 Jalan Tun H.S. Lee, 56000 KL, Malaysia. Opening Hours : 11 am – 12 am. Closed on Sundays. The noodles here are fair and reasonably priced with ultra-fast service but the congee from the stall out front is what I head there for. I find I have to get there well before closing time because the porridge sells out well before the beef noodle shop closes. This place is tried and true though and I find I get a decent feed for a good price. I love hawker joint that are older than me! The beef noodle is indeed the best in town. I love the rice porridge as well. Yummeh!!! The fish porridge was good !